Day 1: - Pick up from your hotel at 0700hrs, after breakfast at your beach resort. Drive alon g Mombasa - Nairobi highway, have a 20 minute stop for refreshments and proceed to Bachuma gate. Enter into the park straight for a game drive until time for lunch. Proceed to Voi Safari lodge for lunch. After lunch proceed to Tsavo West, game en-route. In Tsavo West you will have a game drive at the rhino sanctuary to view the black rhinos and proceed to Ngulia safari lodge for dinner ad overnight. Day 2: - After an early breakfast, proceed to Mzima springs, this is the source of tap-water for Mombasa town. View the ever-changing sceneries of Chaimu volcanic caves. 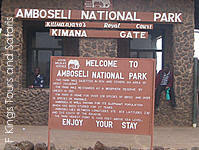 Enter through the Kimana gate and game drive en-route to Amboseli lodge. Relax after lunch at the Amboseli lodge until time for the evening game drive. Dinner and overnight at the Amboseli lodge. Day 3: - Depart from the Amboseli lodge to Nairobi arriving in Nairobi in time for lunch. Have your lunch in Thorn Tree restaurant. After lunch leave for Nakuru. Arriving in Nakuru in time for the afternoon game. Drive to the Lake Nakuru national park for the afternoon game. 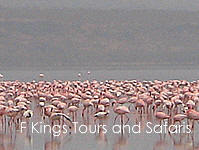 Overnight at either the Lake Nakuru lodge or Lion Hill camp. Day 4: - Early morning game drive in Lake Nakuru national park till 0800hrs. Return to the lodge for late breakfast. Proceed to Lake Bogoria with packed lunch. Lake Bogoria has hot spring boiling water from underground - it boils at 100°C experiment this with eggs. Proceed back to Lake Nakuru for dinner and overnight at the Merica Hotel. Day 5: - Early morning breakfast and proceed to Maasai Mara arriving in time for lunch. Lunch at Sarova camp. Relax up to 1600hrs time for the afternoon game drive. Dinner and overnight at Mara Sarova camp. Day 6: - Depart at 0730hrs from the camp with fully packed lunch. 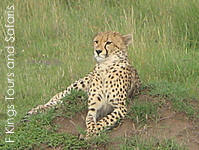 Have a full day game drive up to Mara river. and if lucky see the migration of the wild beast crossing to the Serengeti in Tanzania. Return to the lodge in the evening. Dinner and overnight at the camp. Day 7: - Depart from the lodge at 0700hrs, after breakfast proceed to Nairobi, Via the expansive rift valley. Arrive in Nairobi in time for lunch. Lunch at Thorn Tree restaurant. After lunch proceed to town for a short city tour, Nairobi view point and Nairobi city Market. Proceed afterwards to the railway station for your journey back to Mombasa and finally to your beach resort.